As they mature, social networks are increasingly becoming viable systems for information management. We’re seeing this with Facebook, and with FriendFeed and even to some extent with Twitter. The combination of social graph plus information is a powerful one. And that’s exactly why CubeTree wants to port that idea over to the enterprise world. 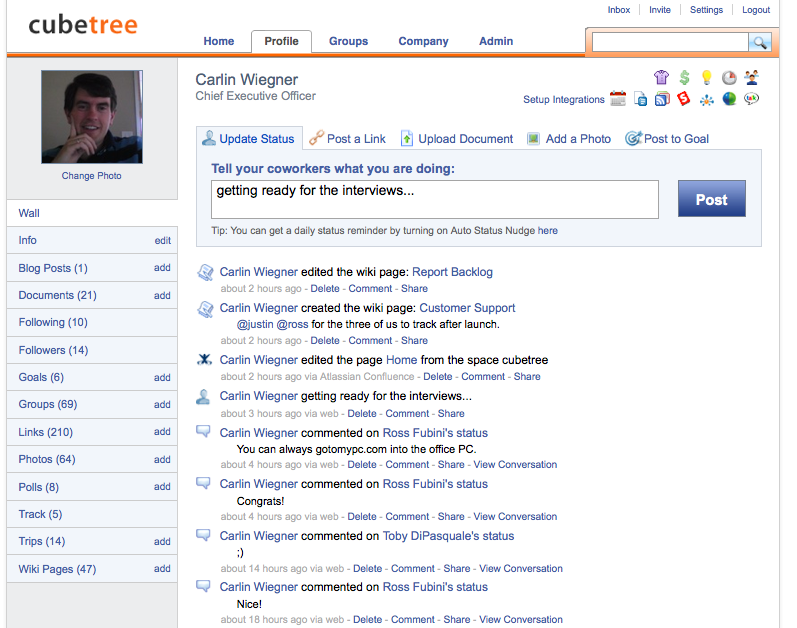 CubeTree’s new enterprise collaboration suite, which is opening to the public tomorrow, has a familiar look: It looks like a cross between Facebook and FriendFeed (more-so before they were both recently redesigned). And that familiarity is part of the idea to getting this to work on the enterprise level. As with other social networks, there are two main components to CubeTree: The Feed and the Profile. But on CubeTree’s feed, instead of seeing updates from everyone in your social graph, you see updates from coworkers. And on your profile page, rather than highlighting pictures or videos of yourself, there is an emphasis on information and documents. CubeTree co-founders Carlin Wiegner (also CEO) and Ross Fubini (also CTO), both formerly with Symantec, recently gave me a walk-through of their product. It’s impressive both in look and feel and scope. They’ve done a great job taking the best parts of the social networks I’ve mentioned above, and putting them into CubeTree with more of a business spin. And I think a lot of businesses may be receptive to that because a lot of their employees have already been trained to use social networks of this ilk, something which Wiegner also pointed out. And in huge companies (the biggest one CubeTree is currently testing with has about 100,000 employees), a network like this can give an employee a face. As you can see in the screenshots, CubeTree places a large emphasis on the micro-updates, just like Twitter . The rationale behind this is that there are often things people maybe want others to know, but don’t want to send out an email to everyone in the company, as Fubini notes. 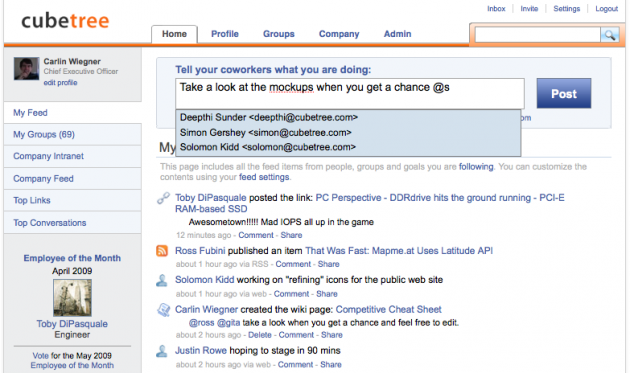 With status updates, employees can give passive updates to coworkers which show up in their stream throughout the day. But that’s not all that goes into the feed, like FriendFeed (and now Facebook), CubeTree can import elements from other social services such as Google Reader shared items, TripIt trips, Salesforce data and others. And just like FriendFeed (and again, now Facebook), anyone can now comment on these items in the feed. But lest you think CubeTree is just a straight knock-off of Facebook/FriendFeed/Twitter for enterprise, there are also several other more unique things it offers. For example, users can upload and share documents, set up goals, set up trip information, create Wiki pages for the company and even create company quizes for others to take. The last one is not what it sounds like, it’s not meant to test others aptitude, but rather fun exercises to get to know your follow coworkers. For example, you may ask a question like “FILL IN THE BLANK loves their iPhone the most.” Other employees then fill in their answers. “People love playing this game,” Wiegner says, noting that it wasn’t originally intended to be used exactly like that. CubeTree also offers a powerful search option to look for things across the network — particularly handy for documents. And there is a “track” option, just like Twitter used to have to alert you when some key word is said. Almost everyone immediately tracks their names, Wiegner and Fubini joked. It’s important to note that social relationships within CubeTree are much like they are on Twitter. That is to say rather than having to friend someone and have them friend you back, you can simply follow anyone in the company you wish. That seems a bit odd since this is an internal company product, so it would seem reasonable that everyone should follow everyone else, but CubeTree wants to make sure users have options still within the company as to how they want to interact with the product. Seeing as CubeTree runs entirely in the cloud, security is an obvious concern, but Wiegner and Fubini, who again both came from Syamantec, placed an emphasis on security from day one and note that CubeTree has passed many leading security tests. That was apparently enough to get at least a few Fortune 500 companies to sign up to test the product out. Right now, the product is being tested with about 100 companies ranging in size from 20 people to 100,000, Wiegner says. There are quite a few competitors to various parts of CubeTree, but the company is convinced that it has the most comprehensive offering across the board. For example, Yammer does the micro messaging aspect for businesses, but doesn’t have all of the other social elements. Then there’s the enterprise wiki work that Socialtext leads the field in, but it too doesn’t have all the other elements. As for pricing, CubeTree has three tiers. The first is the free product which is called “Standard” and offers a company unlimited accounts that are limited to 10 megabytes of storage. The step up from that is “Group,” which for $3 per user per month offers 1 GB of storage and improved security. The third tier is “Enterprise,” which at $5 per user per month offers the best security, storage and management options. One nice thing about the bottom two tiers is that they’re compatible. So basically if you don’t want to buy all your employees the Group package, you can mix between Standard and Group. But if you want to upgrade to Enterprise, your whole network must be running it. There are bulk discounts though over 500 users. 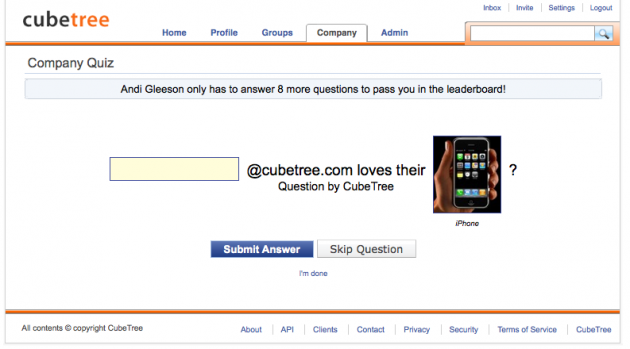 CubeTree was founded in 2008 with a seed round by Mitch Kapor and Trinity Ventures. It raised an undisclosed first round in April and will likely look for another round at the end of this year or beginning of next, according to Wiegner.